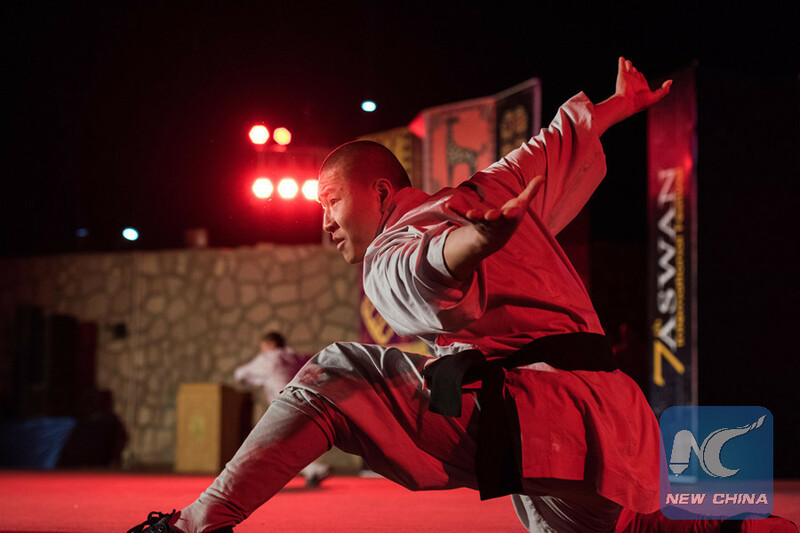 ASWAN, Egypt, Feb. 19 (Xinhua) -- In an open-air theater overlooking the Nile River in Upper Egypt's Aswan province, a group of some 20 monks of Chinese Shaolin Temple amazed the audience with martial art shows. They took part in the seventh edition of Aswan International Festival for Culture and Arts. With light gray robes and black belts, the Chinese Shaolin Kung Fu masters performed professional, skillful and simultaneous moves of martial arts including animal-like fighting styles. 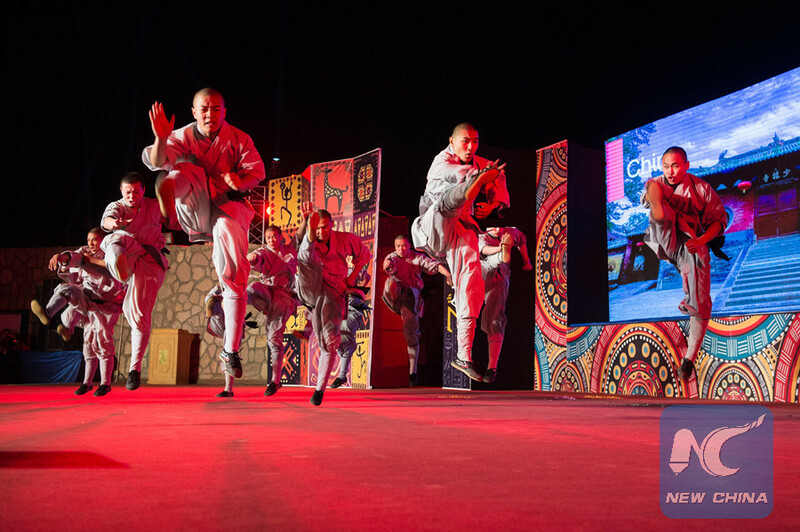 "The Chinese Kung Fu show is well-organized and it features their culture in a very good manner, presenting something neat, admirable and pleasant to the audience," Saeeda Ahmed, 29-year-old woman from Aswan city, told Xinhua after the performance. 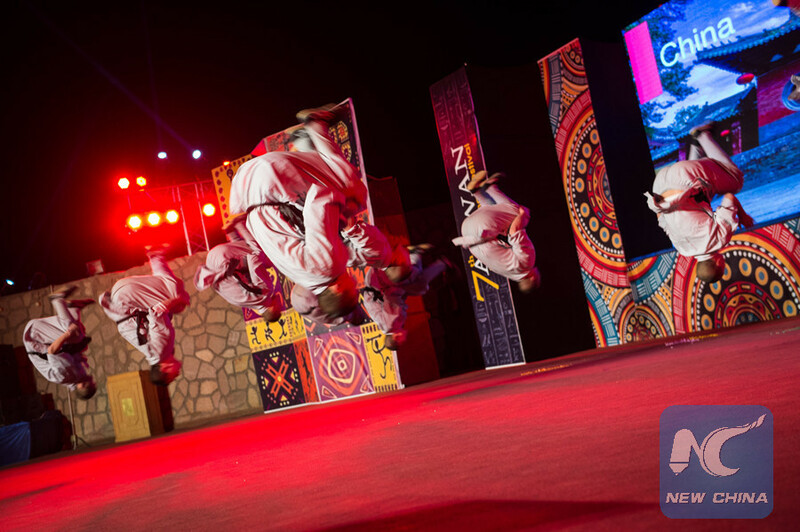 Momin Ahmed, 23-year-old man from Aswan, said that he liked the Chinese show because of the orderliness and skillfulness of the the Shaolin monks. "They all did the same moves at the same moment as if they were copies of one person," he said. Held by the Egyptian Culture Ministry from Feb. 17 to 22, the event gathers more than 20 folklore bands and traditional groups from at least 13 countries from Africa, Asia and Europe, performing songs, dances and shows reflecting their unique cultures and traditional arts. Egypt's Minister of Culture Inas Abdel-Dayem said during the opening ceremony that Egyptian-Chinese ties are old and deep-rooted with long-time exchange in the fields of arts and culture. "China always presents with us in many cultural activities in most Egyptian provinces, including Luxor, Aswan and the capital Cairo. In fact, there is a massive cultural exchange between Egypt and China," the minister told Xinhua at the entrance of the 1,200-seat theater with colored lights surrounding its gate and fence. Organized by the General Authority for Cultural Palaces, the event gathered folklore groups from Egypt, Sudan, Algeria, Morocco, Jordan, Palestine, the Democratic Republic of the Congo, Kenya, Mauritius, China, Indonesia, Poland and Greece. Shaolin Kung Fu, also called Shaolin Wushu, is one of the oldest, largest, and famous styles of Chinese martial arts, which originated and developed in the Shaolin Temple in central Henan province. In each show, the Shaolin Temple's group performed pictographic boxing, a type of traditional Chinese martial arts derived from the movements of animals, including the snake, tiger and monkey styles. The festival is held to mainly celebrate Egypt's current presidency of the African Union. Aswan Governor Ahmed Ibrahim, who attended the opening performances of the event, said that he visited China many times, expressing appreciation of China and describing it as "a beautiful country with many unique cultural features." "We feel that the Chinese group performs here with a spirit of friendship and there's closeness between them and the Egyptian people," the governor told Xinhua during the festival. "I am very happy with the Chinese group and we hope to see them every year," Ibrahim added. In another evening during the festival, the Chinese Shaolin Kung Fu group performed at a cultural venue in the town of Kom Ombo, about 50 kilometers north of Aswan. They presented a different show including breaking a steel pad with the head and playing with a double-blade knife, nine-section whip and other tools. "The Chinese performance was amazing and we wished it lasted longer," said Amal Sayyid Ali, a lady in her late 50s from Kom Ombo, adding that it was not her first time to watch a Chinese show in her town. The Chinese Shaolin Kung Fu artists are scheduled to continue their performances until Feb. 22. A carnival will be held at that day to mark the early morning sunray illumination of Ramses II statue inside one of Abu Simbel twin temples in Aswan, after sunshine penetrates the whole length of the temple to reach and light up its inner sanctuary.